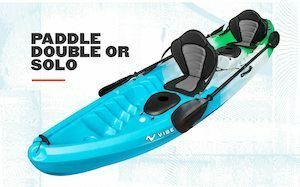 If you are looking for a low impact activity to improve your overall aerobic fitness, then this Vibe tandem kayak review is for you. Like many anglers, we love to go kayaking not only as a hobby but sometimes for its competitive nature. Who doesn't want an extra feather on their cap, right? Here is a quick recap on what we think of this kayak. Well outside of lone angling and sporting activities, kayaking can also be a great fun activity for family and friends. You not only get to enjoy the waterways together, but you can experience a shared sense of meditative peace than kayaking alone can bring. The Vibe Kayaks Skipjack 120T 12-feet tandem kayak is a gorgeous looking, a sturdily built kayak that can seat at least three people. First time I saw it online I fell in love with it, because now I could take my wife and five-year-old son with me to the nearest waterway. And that's not the only thing that caught my eye! While you can fit three people on it, you can also choose to paddle solo atop the middle seat. How cool is that? One kayak for all seasons people! What I do know is that this option is not very common in many tandem kayaks, and this is what makes the vibe kayaks skipjack 120t tandem kayak such an excellent value for your money. What Exactly are Tandem Kayaks? Solo kayaking is the ultimate freedom sport for me, given that solo kayaks are pretty easy to paddle. Tandem kayaks are a significant investment for couples who share a love for kayaking. A tandem kayak is more extended, therefore much harder to turn than a solo kayak. When out on our kayak skipjack 120t, we get to depend on our synergy to paddle together. There's never a dull moment atop this kayak. We get to explore and fish together, as we paddle our way to health. This kayak has given my family and me the ultimate recreational, fun tool that we can share together, and grow as a unit. When out all day on a kayak, storage can be quite a problem, sometimes limiting the amount of time or distance you can cover on the water. My family and I love that with this kayak, we have great onboard storage facilities. Just like the compact vibe skipjack 90, this kayak has dual sealed hatches and a rear tankwell for storage, coupled with adjustable bungee. This makes all day exploration a non-issue because we get to bring along enough food to last us the day. And because we take along some rain gear and stuff, we get to store them away safely till when we need them. I can go on and on about the importance of onboard storage for kayaks, and this kayak's designers were very thoughtful about it. The vibe skipjack 120t kayak fish rigging is designed with the apt wrangler in mind. Would you like to know the main difference between an ordinary kayak and a fishing kayak? Believe it or not, it is the presence of rod holders. Rod holders will free up an angler's hands for de-hooking fish, paddling or to throw something filling in his mouth. You cannot underestimate the importance of rod holders my friends! 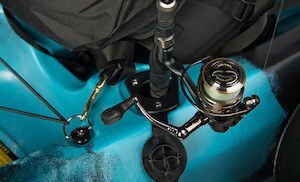 This kayak has two capped fishing rod holders flush mounted for your comfort. There are an additional four mounting points, for your accessories compatible with all major brands. I was so excited by these two features. Mostly because I am not interested in drilling holes in this new vibe kayaks beauty. I am one of those anglers that have a disease borne of years of boating. I often have the urge to have a few rods on board, though I do not always get to use them all. With this kayak, I can mount accessories by Vibe, RAM, Railblaza or Scotty, that many sporting good stores carry. 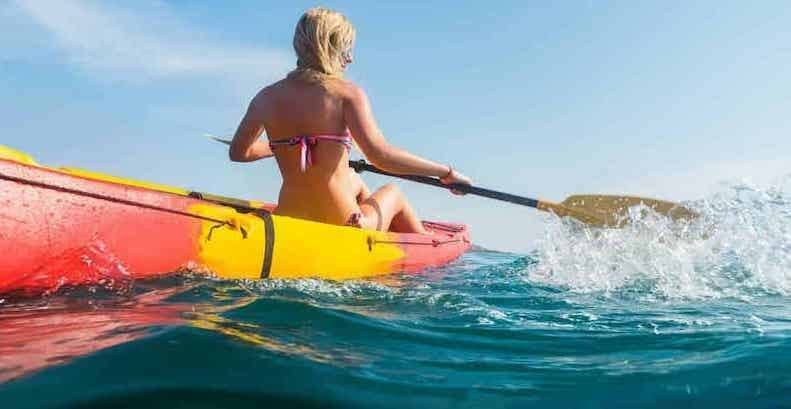 Paddle parks on a kayak ensure that you have a place to attach your paddle directly to the kayak when out in the water. This ensures that you do not lose the oars in the water, held securely by a series of clips or lines. 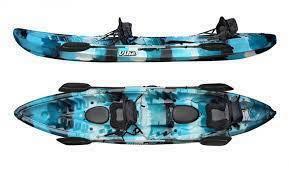 Two side paddle parks and two paddle rests are part of the vibe skipjack 120t accessories. The bungee paddle parks are well fitted and designed to help you retrieve the paddle from your sitting position with ease. 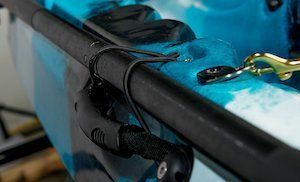 Scupper holes are a great design feature that ensures that your kayak does not turn into a bathtub when out in choppy waters. They drain water from the kayak from top to bottom, eliminating all puddles. The vibe sea ghost 110 has a whopping ten scooper holes, as compared to this kayaks four. It is no loss though since the vibe skipjack 120t solo is meant for less choppy waters. The kayak also has four scupper plugs that fit perfectly into the scupper holes to keep the water from coming in especially in rough waters. This vibe tandem kayak review would be incomplete if I did not mention all the comfort features this kayak has. For one the seats are comfortable and can hold two adults and a child too on the center seat. 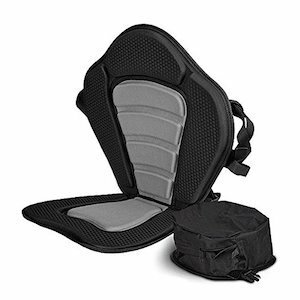 The adjustable seats have buckles to keep you safely reigned in. 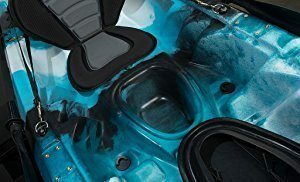 There are also two inbuilt cup holders to hold your beer cans, coffee, water or your child's favorite drink as you paddle away in placid waters. Unlike the 62 pounder vibe skipjack 100, this kayak weighs ten pounds more, resting at 72 pounds weight. The Vibe Skipjack 120T has a 12'2" length, and 33" width, making it roomy and spacious enough for tandem kayaking. The beauty of its size is its 500 pounds carrying capacity, enough for two or three people and the required gear. The kayak is made from a single piece, high-density Rotomolded polyethylene. The colors are part of what drew to this excellent kayak. Am talking about great Hunter Camo, Blue Camo, and Sea breeze colors. It is really a thing of beauty this kayak. 1. Good Weight Limits:- The fact that it can hold three people, and at least 500 pounds of weight is this kayak's crowning glory. You can also paddle it solo too for that alone timeout in the waters if you so wish. 2. Has inbuilt pole holders as well as four different mounting options:- The deal for me cant get any sweeter than this. But with all this space comes its weight issue. It is really not easy to move it, and I have had to purchase a kayak dolly for ease of movement. It has four easy grip carrying handles though to help move it, which is great if you have an extra pair of hands to move it to the waterfront. 3. Good Quality:- It is sturdily built and of excellent quality materials. And to ensure that it does not dent it is wrapped in lots of bubble wrap and a heavy blanket, which can be retained and reused for other purposes. 4. Stable and User Friendly:- The 120t is quite stable and perfect for beginners, as it is made to ensure ease of handling. Not suitable for strong currents:- This kayak's tracking quality is okay for slight choppy waters but not good enough for strong currents that a vibe sea ghost fishing kayak can handle with ease. It is excellent though on calmer waters and rugged enough for any environment. You can find more kayak options for calmer rivers here. If you wish to know more other brands, you can check out our reviews on Best Kayak Brands. Many vibe tandem kayak reviews online recommend the Skipjack 120T as a great buy, sturdily built and a perfect recreational kayak for the family. 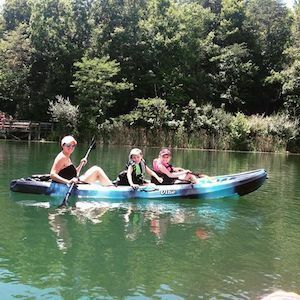 I love that this kayak gets the job done and I would definitely recommend it to any other family man or woman looking for a kayak that fuels the family fun. 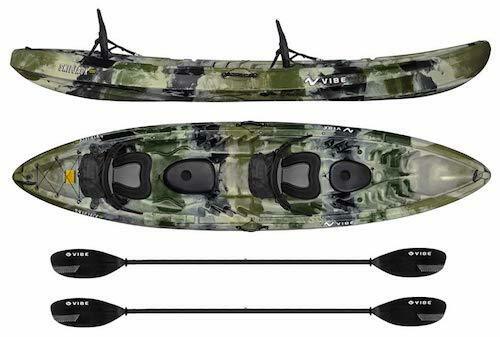 Any angler, young or old, novice or master will find this kayak easy to handle. To conclude, I would advise against the use of this craft for competitive racing, as it is not designed for speed, but for space and comfort. I would most definitely give it a five out five rating for it being the best tandem kayaks out there.